WASHINGTON – Only four of the 64 Arizona hospitals that were rated in a new nationwide government report on patient satisfaction got the top five-star ranking. The report by the Centers for Medicare and Medicaid Services (CMS) surveyed patients who were asked to rank facilities where they had just been treated on a scale of one to five stars. Arizona hospitals averaged three stars, putting the state 41st in the nation. Hospital officials in the state downplayed the rankings, saying that while consumer satisfaction is important, it is just one factor in many that determines the quality of a hospital. But a CMS spokesman said the approach to deriving the rankings is “methodically sound” and that the star ratings are meant to be easily accessible for consumers who want or need to compare different hospitals. The rankings were posted for the first time this month on Hospital Compare, a CMS site that lets people compare data on more than 4,000 U.S. hospitals. “Despite the criticism you may be hearing from some naysayers, CMS believes that star ratings will improve the accessibility of quality information on Hospital Compare for patients and their families,” said Tony Salters, the agency spokesman. The four top-ranked Arizona hospitals were Banner Goldfield Medical Center in Apache Junction, Arizona Orthopedic and Surgical Specialty Hospital in Chandler, Arizona Spine and Joint Hospital in Mesa and the Mayo Clinic in Phoenix. A Kaiser Health News analysis of the numbers said many of the five-star facilities across the nation were specialty hospitals. Of the other ranked hospitals in Arizona, 14 were four-star facilities, 27 got three stars and 19 earned two-star ratings. No hospitals in the state earned one star, the lowest possible rating. Some hospitals, like Tempe St. Luke’s, were not included in the data if there were not enough survey responses from patients at the hospital. An official at Mesa’s Mountain Vista Medical Center, which got a two-star rating, said in a prepared statement that while consumer perception of care is one factor in determining quality of care, there are others that should play into choosing a hospital such as actual treatment outcomes and recommendations by people they trust. “While a patient’s experience is an important part of their stay, the new CMS star ratings do not address other significant aspects of patient care such as patient outcomes and safety,” said the statement by Tony Marinello, Mountain Vista CEO. “Patients now have access to a large number of hospital ratings reports, and they should use all available tools out there when choosing health care providers, as well as consulting with their physicians, friends and family,” his statement continued. Banner Health, a multistate health network based in Phoenix, said in a prepared statement that “73 percent of our facilities system wide received either four or five stars.” It sees the numbers as important – but like Marinello, said that the star ratings are not the full measure of a hospital’s overall quality. Salters said the star ratings are doing what they were intended to do – help people make an informed choice. A Centers for Medicare and Medicaid Services report ranks hospitals on a five-star scale based on patients' responses to surveys about their care. 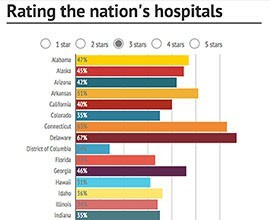 Arizona hospitals average 3 stars in the report. Click on the chart for an interactive state-by-state report.